Golden Gate Estates lot offers a quiet setting within a growing community that has access to everything! This lot & this community are convenient to Immokalee Rd which will take you easily into Ave Maria, Ft. Myers, Naples, Bonita Springs and the City of Immokalee. This lot offered, at 2.27 ac MOL. Property Appraiser has the lot dimensions as 150W x 662L, 99,028 sq ft. If you are looking for space and privacy in a setting that will allow you to have your home, toys and actually enjoy them, then this lot for you!!! Have a boat, ATVs or horses? Bring them/ride them in your back yard, park them/prep them for a weekend, there is plenty of room. Wanting to build a your dream home? Want space while being able to have access to all the amenities of being in a neighborhood community that offers peace, quiet and location. Drive by, check it out & be one step closer to your dream home! Wetland Det in hand, DEP has indicated that a permit/mitigation may be nec to build on this lot-position/size, w/ other factors re buyer’s usage/placement of structures will determine final decision. Sellers have taken these factors into consideration relative to the asking price of this lot. 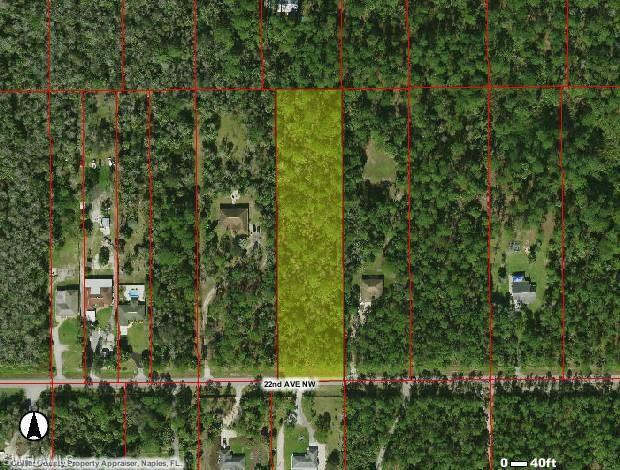 LISTING PROVIDED COURTESY OF Nicole A Kozak, Premiere Plus Realty Co.
22nd AVE, Naples FL 34120 is a Land, with 0 bedrooms which is for sale, it has 0 sqft, 150 sized lot, and 0 parking. A comparable Land, has 0 bedrooms and 0 baths, it was built in and is located at 24TH AVE NAPLES FL 34120 and for sale by its owner at $ 120,000. This home is located in the city of NAPLES , in zip code 34120, this Collier County Land, it is in the GOLDEN GATE ESTATES Subdivision, and are nearby neighborhoods.